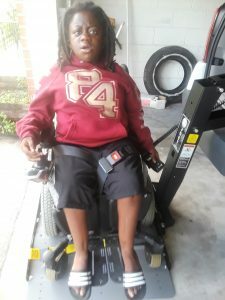 Saniya gets new wheelchair lift! Saniya checking out her new Bruno Joey Lift! The wheelchair lift will make life so much easier for her and her caregiver. The 18-year-old is diagnosed with Osteogenesis Imperfecta, otherwise known as brittle bone disease and was born with 2 broken arms and 2 broken legs. She is unable to walk and uses a power wheelchair for mobility. 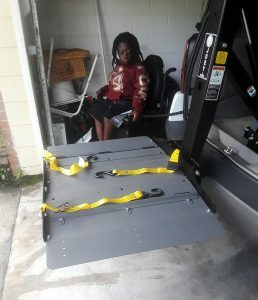 Saniya’s previous vehicle lift was broken and needed to be replaced. Since she is wheelchair bound, it required two people to lift her in and out of the family van. The Bruno Joey lift will make transportation safer for her and her caregiver! Go Saniya!